by Josephine Mori & Jill Stockwell. Deck created by Dan Staroff. Measurements: 2.95 x 4.5 inches, or 75 x 110 mm. Back of card: Navy blue with tiny white stars. Around each star, a tiny light blue star outline. White border overall. May be inverted. Booklet included: Yes, 40 pages, 2.75 x 4.35 inches, or 70 x 110 mm. Includes two Tree of Life diagrams. Publisher: US Games. Deck printed in Belgium, booklet printed in the US. The Tarot of the Sephiroth began out of a desire to present a more unified & comprehensive portrayal of the Tarot. My intent was to break through the veils & shadows of traditional tarot images & to interpret them for a new era in which accessibility to the concepts & constructs of the Qabalah was key. The mysteries of the Qabalah can be accessed through the spheres & paths of the Qabalistic Tree of Life, as illustrated in the Tarot of the Sephiroth. This is your key to unlocking those mysteries. Use it wisely. To this end, court cards have a quarter of a large colored sphere in one corner or another. See the Queen of Disks & the Princess of Wands illustrated above. If you put all four kings together, you get a big gray sphere (actually, a circle): Top row: King of Disks & King of Wands. Bottom row: King of Swords & King of Cups. These four cards, properly arranged, produce a big gray circle. The four Queens produce a black sphere, the four Princes make a yellow one. Oddly enough, the four Princesses have four differently colored spheres. The major arcana can be laid out to illustrate the Tree of Life. 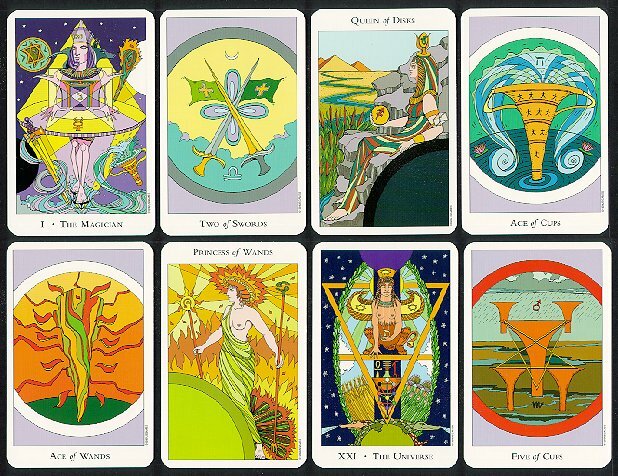 Each major arcana card has a part of a sphere on one side of it, connected via a colored stripe to a differently colored part of a sphere on the other side of the card. These spheres & connecting stripes can be top to bottom, side to side, or one of various diagonals. The Magician card (illustrated) has a fraction of a white sphere in the upper right, connecting via a yellow stripe to a black sphere in the lower left (look hard). Major arcana card XXI, The Universe (illustrated above) has a purple sphere on top, connected by a black stripe to a green sphere on the bottom. These are initially hard to see, but they are there. Following the diagram on page 5 of the booklet, you can lay all 22 majors into a Tree of Life, but there is much overlapping. If you overlay the twos, threes, sixes & tens, the circular borders will align with the spheres formed by the court cards. This means that twos relate to Kings (both gray), threes relate to Queens (both black), sixes relate to Princes (both yellow). The multi-colored tens relate to the multi-colored Princesses. There is certain to be much else in this deck as well. Use this deck to help unlock the mysteries of the Qabalah.